“Poetry distribution”—that’s one of my least favorite oxymorons. Due to poetry’s limits as a commercial venture, there isn’t much infrastructure for distributing poetry books. This is further complicated when one tries to distribute a poetry book internationally as currency exchange fees and shipping can be prohibitive relative to the cost of a book. I was faced with this issue when I wanted my first Selected Poems book, THE THORN ROSARY, to be available in my birth land, the Philippines. The word sari-sari is Tagalog meaning "variety". Such stores form an important economic and social location in a Filipino community. It is present in almost all neighborhoods, sometimes even on every street. Most sari-sari stores are family-run privately owned shops and are operated inside the shopkeeper's house….Candies in recycled jars, canned goods and cigarettes are often displayed while cooking oil, salt and sugar, salt and sugar are stored at the back of the shop. They also distribute prepaid mobile phone credits.… [T]hey may have refrigerators that can store other products such as soft drinks, beers and bottled water. Sari-sari stores are so ubiquitous that it wasn’t hard for me to find one within my own clan: cousin Dona manages such a store in Santo Tomas, a day’s car ride away from the nation’s capital, Manila. Though Dona’s tiny store is set in a quarter of the space of my garage in California, it has become the third or fourth most effective distributor of THE THORN ROSARY. 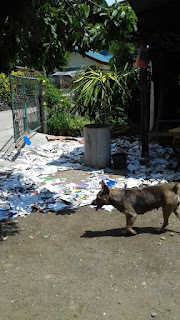 If someone in the Philippines tells me they’re interested in my book, I inform Dona (by email or through Facebook) and she mails it domestic throughout the country’s 7,000-plus islands—an inexpensive method. 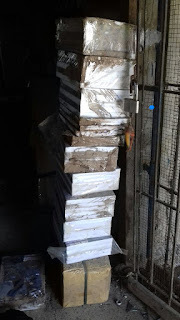 I'm grateful to have Dona’s generous service—and I love the idea of books located amidst potato chips, crackers and other snacks, toothbrushes, detergents in single-size envelopes, cigarettes, arak, seasonal vegetables and fruits from nearby farms, sanitary napkins, cologne and other sari-sari lovelies. I love the idea of poems inhabiting life at its most mundane levels, rather than being relegated as books to the author’s basement or school bookshelves where they might be mostly ignored except when reading is forced through assignment. I haven’t surveyed the archipelago’s sari-sari stores but it wouldn’t surprise me if Dona’s store is the only one pitching poetry. 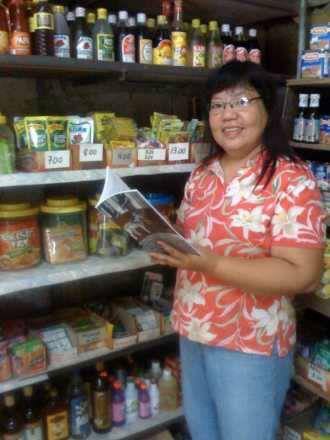 Here’s Dona at her store as she reads another book she “distributes,” my mother’s memoir, DAWAC by Beatriz Tilan Tabios. In my case, Dona recently experienced an inventory problem due to … termites! Let these ugly photographs explain. Termites chewed through about 30 books, about half of the inventory. 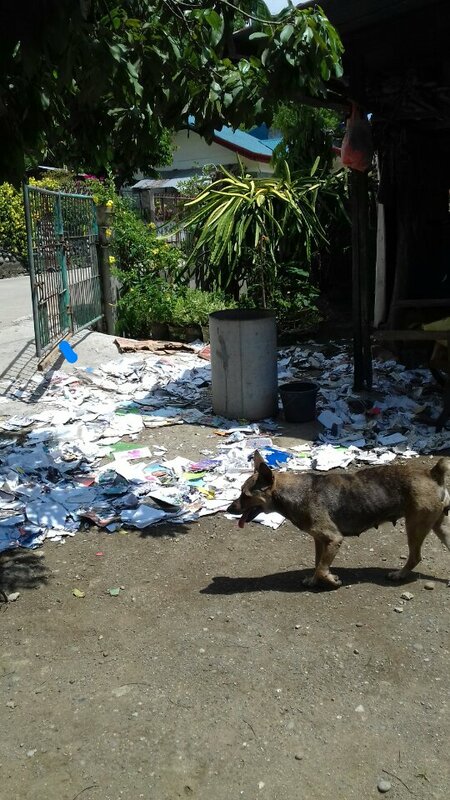 To prevent the termites from spreading, Dona had to dispose of them in the area where trash is usually burnt. 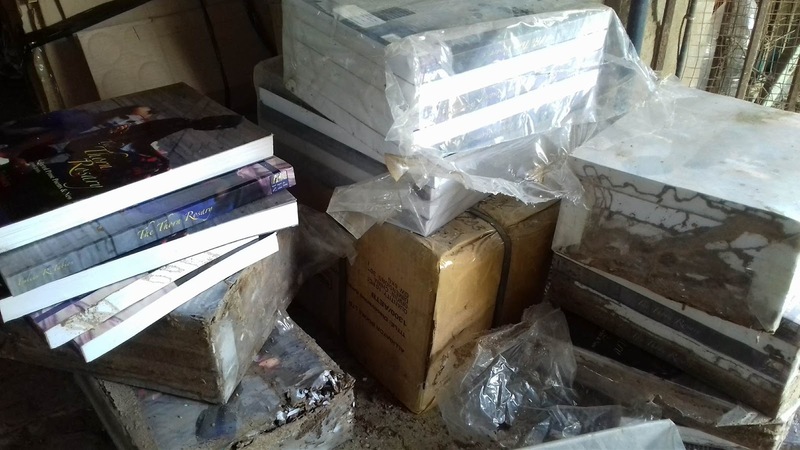 I suppose I could have wept from the loss of 30 books. But I actually didn’t mind—the outcome, to me, seems to manifest something about Poetry, perhaps its evanescence or fugitive state … or that poetry, too, is a favorite sport by mischievous (or cruel) gods. Take that, termites! The chickens ate you, then Poetry—as ever—had the last word! P.S. And Jose Padua? He not only was pleased, his wife was pleased.